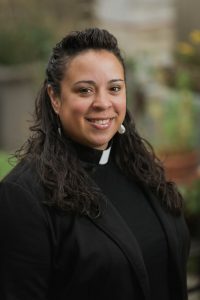 Leila M. Ortiz is Assistant to the Bishop of the Metropolitan Washington DC Synod of the Evangelical Lutheran Church in America (ELCA). As an ordained minister of the ELCA, Leila self-identifies as a Luthercostal (where Pentecostal spirituality meets Lutheran theology) pastor and theologian who is less interested in the “right” way to do church and more interested in being church for the sake of our complicated, messy, and ultimately, beautiful world. She is passionate about justice, peace, and helping others recognize the unique expression of God’s image in every member of the human family. Yehiel Curry ‘s journey to becoming an ordained Lutheran pastor is an uncommon one, and the congregation he serves similarly had an uncommon beginning: Shekinah Chapel in Riverdale, Illinois, grew out of its origin as a youth development program for young African-American men. Pastor Curry was born and raised on the south side of Chicago and his first involvement with the Lutheran church was through a mentoring program. He attended Lewis University in Romeoville, Illinois, where he received a B.A. in Psychology in 1995. Immediately after college, he worked as a social worker providing mental health counseling and case management to youth and adults with a concentration on the impact of drugs, violence and poverty on communities. He was ordained in 2009 and he received his Master of Divinity in 2013. Pastor Curry serves as a board chair and Camp Director for Rescue Release Restore, Inc. – a mentoring organization that now runs the SIMBA/SIMSA camps for African-American youth and MYLA Camp, a multicultural youth leadership camp. Pastor Curry and his wife, Lashonda, have three daughters.